FA: George Ridgley et al., October 2008. A deceptively difficult slab to shallow corner with technical slab and knobs at the top, the only reason City Girl doesn’t get more stars is a section of very easy climbing in the middle of the pitch. Amusingly, the hardest route off of Blitzo’s Balcony was intended to be the easiest! To the right of White Lie on the broad face over to Errett Out are several multi-pitch routes with no bolts at all. Extremely runout, these routes are The Silence of the Cams, Unknown Route, Circus Maximus, Easy Walk, Repo Man, and Vacillation. 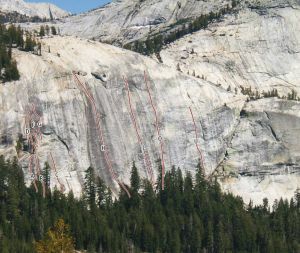 In the vicinity of Errett Out and Bit by Bit, Jeff Dozier and Eric Beck climbed a route in 1971 called Vacillation. No bolts were used on their very runout route, which is probably closest to the modern route Errett Out and the 80s route Repo Man. Which SuperTopo guidebooks include a topo for City Girl?